On six of the most gorgeous islands in a region famous for its endless white sand expanses, exquisite turquoise waters and romantic sunsets. From Jamaica's warm reggae pulse to the Bahamas' sophisticated beat and from St. Lucia's volcanic majesty to Antigua's exotic allure. 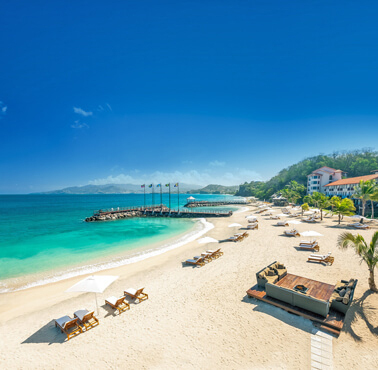 Sandals provides the best beach resort experience in the Caribbean in a glorious all-inclusive package. Beaches protected by offshore reefs create the calmest waters for leisure swims. 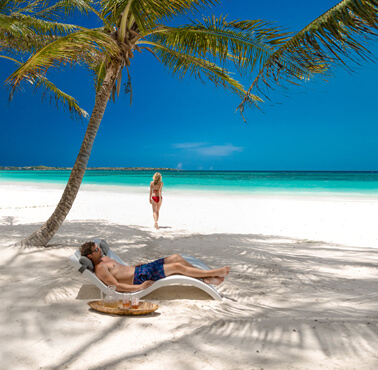 The beaches in Jamaica are truly spectacular, from secluded private coves to Negril's world–renowned seven–mile stretch of powdery white sand, all looking out onto the ultra–clear, turquoise waters of the Caribbean. 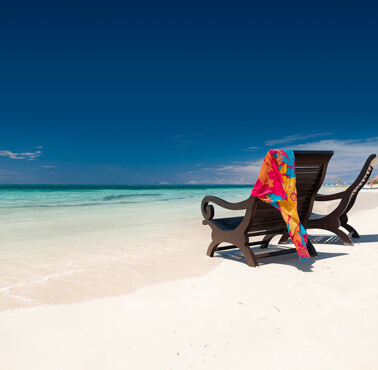 On the best stretch of Negril's famed 7-mile white sand beach. A quaint cove beach parallel to the resort plus a private offshore island beach. Waterside drinks and spirits at a private cove beach or exclusive Ochi Beach Club. On two of Jamaica's most tranquil private cove beaches. A two-mile unspoiled white-sand beach that extends into a nature preserve. Endless crystal turquoise water beguiles the senses and invites you to explore vibrant coral reefs beneath its surface in this quintessential island paradise. Secluded within a tropical 500-acre enclave, this mile-long beach looks out onto the breathtaking waterscape. A three-in-one beach experience - one private beach cove and two white sand beaches on an offshore island. 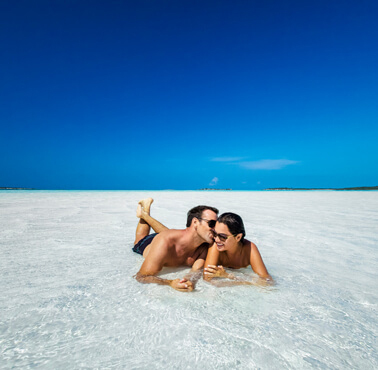 Famous all over the world for its 365 spectacular beaches, with sand so pure it casts a pinkish hue and the clearest, aqua–blue waters imaginable, make Antigua one of the most priceless gems in the Caribbean. 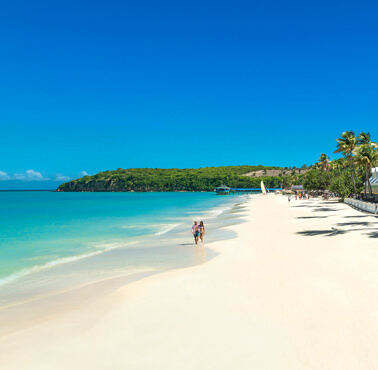 The island of Antigua boasts 365 beaches and Sandals Grande Antigua is located on the best on them all! Saint Lucia's exotic beauty truly captures the luxuriant allure of the Caribbean. From the distinctive twin peaks of Les Pitons to the cascading majesty of Diamond Falls and the translucent turquoise sea that frames it all, Saint Lucia dazzles the eye as it seduces the body and spirit. Perfect setting for rest and romance on a private cove beach bathed in sunshine and lush foliage. Sunrises and sunsets leave colorful imprints on the surrounding mountains and bay-facing beach. An idyllic escape with a long stretch of beach and restful ocean. An exotic, unspoiled hideaway. Home to both black sand and white sand beaches with water so blue and clear that coral formations can be spotted from the air, Grenada's volcanic origin has created a landscape of great beauty and variety. A private cove beach with unforgettable panoramas of the charming hillside and glittering sea. Discover the vibrancy and charm of a lively destination, A bustling South Coast hotspot comprised of a stunning beachfront, colorful nightlife, and superb restaurants and lounges. Endless vistas from the comfort of beach chairs or a magnificent beachfront whirlpool just off the shore. Experience the royal treatment at the all-new, all-suite resort, all on a jet-setter destination.